The current week's homily is available on a link on the front page of the website next to the link for the current week's bulletin. On the page with the prior bulletins, the corresponding homily will be sitting side by side with its bulletin. We started on the anniversary of the start of the Catholic Church, Pentecost Sunday --- four years ago. This week, the Feast of the Holy Family, is our two hundred ninety eighth!! podcast to be posted. The homily is given by Deacon Dwayne Joubert. Last week at Christmas we thanked God for his Love for us by celebrating His Incarnation and sending His Son to live among us. By Jesus' life, death and resurrection He gained for us our eternal salvation. Hopefully, our focus last week was one of appreciation of God's Love, and that this Love for us will prompt us to return the favor by turning away from our sins, following His commands, entering into a prayerful relationship with Him, and turning our lives over to Him. As we continue the Christmas Octave and Season, our focus shifts to the celebration of the Holy Family and Our Blessed Mother. Both the Holy Family and our Blessed Mother are gifts God has given to us as models for our families and of our individual discipleship. They provide examples to us as ways to grow closer to Him. In our Blessed Mother, we see God's gift of humanity to itself, that is, she and her cooperation with God's Grace is a gift to us because of her unique role as Mother of God. We also are called to be gifts to each other by being a light in the world bringing Jesus' peace to each other, just as she did. In that regard, I want to thank all of you for being a light to me through your kindness over the past year, and especially during this Christmas Season. Your generosity in so many ways continues to be humbling and is very much appreciated. Unfortunately, there are too many of you to thank individually for all that you have given to me, both tangibly and spiritually, during this Christmas Season. Please accept this note of appreciation as my sincere gratitude for the gift you are to me. I am very blessed to be your pastor, and I thank God for allowing me to be so. Please continue to pray for me, and I will continue to pray for you. May you have a blessed 2014! Special thanks to the American Bank and Trust Company for providing our parish calendars. They have been doing this for years!! Please remember to thank them whenever you can. The bulletin for the week of December 29, 2013 has been posted. Click here to see it. 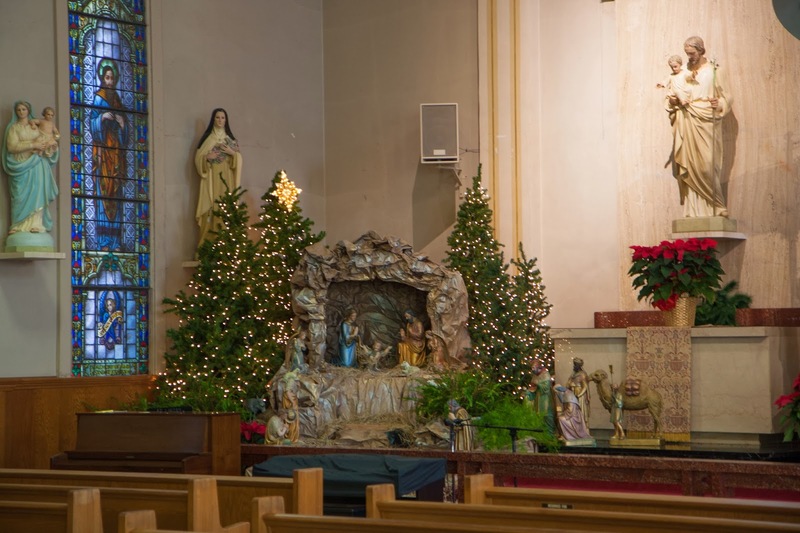 The staff and parishioners at St. Landry Catholic Church always do a beautiful job decorating during the Christmas season. Here are some photos of the inside of the church. The current week's homily is available on a link on the front page of the website next to the link for the current week's bulletin. On the page with the prior bulletins, the corresponding homily will be sitting side by side with its bulletin. We started on the anniversary of the start of the Catholic Church, Pentecost Sunday --- four years ago. This week, Christmas, is our two hundred ninety seventh!! podcast to be posted. The homily is given by Father James Brady. The current week's homily is available on a link on the front page of the website next to the link for the current week's bulletin. On the page with the prior bulletins, the corresponding homily will be sitting side by side with its bulletin. We started on the anniversary of the start of the Catholic Church, Pentecost Sunday --- four years ago. This week, the Fourth Sunday of Advent, is our two hundred ninety sixth!! podcast to be posted. The homily is given by Father James Brady. This week, we begin to celebrate Christmas. Of course, we celebrate Christmas Day on Wednesday in a special way, it being the day we celebrate the birth of Jesus Christ, our Lord and Savior. However, we continue to celebrate the Christmas Season until the celebration of the Baptism of the Lord on January 12, 2014. The secular world will be finished with Christmas by the day after and will begin to focus on the New Year. We, on the other hand, will continue to celebrate the Mystery of the Incarnation for more than two weeks. Our Blessed Mother reflected on the marvel of the Incarnation in her heart (Luke 2:19). So should we. We will celebrate The Holy Family, Our Blessed Mother, The Epiphany and the Baptism of our Lord in the weeks following Christmas. We are given these Holy Days to strengthen our faith in The Incarnation and ponder the gift of God's love in the human nature of His Son. Enjoy reflecting on the gift God the Father has given us in His Son. Enjoy reflecting on the gift Jesus has given us in His Life, Death and Resurrection, the events that have led to our salvation. Enjoy reflecting on the gift of the Holy Spirit, who prompts and empowers us to live a life in imitation of Christ. Ponder the gift of eternal life (our one true Hope), given to us if we follow the promptings of the Holy Spirit. 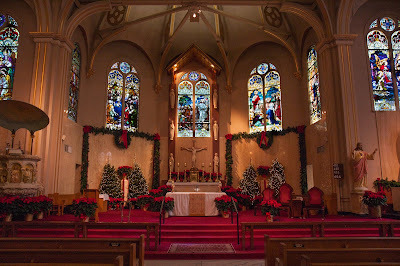 Let us, as a community, not follow the world in allowing Christmas to end after December 25, but rather keep the Christmas spirit in our hearts all year by continuing to celebrate and reflect on the great gift we have all received at Christmas: the gift of God Himself dwelling among us, leading to eternal life with Him. The bulletin for the week of December 22, 2013 has been posted. Click here to see it. The current week's homily is available on a link on the front page of the website next to the link for the current week's bulletin. On the page with the prior bulletins, the corresponding homily will be sitting side by side with its bulletin. We started on the anniversary of the start of the Catholic Church, Pentecost Sunday --- four years ago. This week, the Third Sunday of Advent, is our two hundred ninety fifth!! podcast to be posted. The homily is given by Father James Brady. As we near the end of the calendar year, there are a couple of things I would like to bring to your attention and ask for your help. Initially, with the end of the calendar year we are also approaching the end of the first half of our fiscal year. In September we published a budget for expenses for the upcoming year along with anticipated revenue. We anticipated a 5% growth in our regular offertory for planning purposes, which was conservative in light of the previous three years. However, there has been roughly a 10% decline in our regular offertory, creating a 15% difference between what was an anticipated and actual offering. This is a significant difference which has impacted our ability to achieve the goals set forth at the beginning of the fiscal year. If you are able, please put St. Landry on your Christmas gift list this year, and consider an increase your regular offertory in the New Year. As was mentioned in the parish report in September, every offering is appreciated and needed, and please know that it is never insignificant! Our hope is to continue making progress in improving the beauty of our worship, to continue the maintenance and improvements of our beautiful buildings, and to provide better pastoral services to all in need, especially those who are most vulnerable. Know of my thanks in advance for your generous response! Second, our Chancellor at Opelousas Catholic, Msgr. Keith DeRouen, has asked for additional input regarding the school by way of a follow up survey to the one taken at the beginning of the school year. Copies of the surveys are on the tables at the back of the church near the confessionals. These surveys are not only for parents of our children who attend Opelousas Catholic, but for all of our community who are interested, including alumni, grandparents and friends of the school who would like to comment. The surveys are self-explanatory and should be returned to our office by noon on December 31, 2013. Thanks in advance for your participation and input! Please know of my continued prayers for all of us during this Advent Season to "prepare the way of the Lord" for His coming at Christmas. On Wednesday, December 18th—from 6:30-8:00pm, we will be offering confessions here at St. Landry, together with all the Catholic parishes in the Diocese of Lafayette. This outreach is called “The Light is On For You,” and is an effort on the part of our Diocese to highlight the importance of the Sacrament of Confession in the life of Catholics and to make it as easy as possible for every Catholic to come or to return to this great source of God’s mercy and healing love. You are welcome to come here or to go to any other Catholic parish in the Diocese. Please make plans to come yourself and please invite others to take advantage of this great opportunity to be reconciled and begin anew your journey in faith this Advent. The bulletin for the week of December 15, 2013 has been posted. Click here to see it. The current week's homily is available on a link on the front page of the website next to the link for the current week's bulletin. On the page with the prior bulletins, the corresponding homily will be sitting side by side with its bulletin. We started on the anniversary of the start of the Catholic Church, Pentecost Sunday --- four years ago. This week, the Second Sunday of Advent, is our two hundred ninety fourth!! podcast to be posted. The homily is given by Father James Brady. As we move into the Second Week of Advent, the theme of the Gospel reading this week moves from being vigilant and alert for the coming of Christ to the theme of repentance. Our vigilance includes making sure that we are following Christ as He is, not how we want Him to be, and then practicing our Faith as Christ and His Church have taught us. Our vigilance is directed to our preparation for our judgment, and our Hope of ultimate union with Him in Heaven at the end of our earthly life. This week, however, the movement of our heart should be one of repentance and seeking the forgiveness of our sins. John the Baptist, Christ's forerunner, preached repentance for preparation of the coming of Christ. In that regard, we as Catholics are privileged to have the Sacrament of Confession (also referred to as the Sacrament of Reconciliation or Penance). In the Sacrament of Confession not only are our sins forgiven, but also we are given the Grace to overcome our sins and thus be freed from them. During Advent, in preparation for receiving the Grace God wants to give us in Jesus' Incarnation at Christmas, Sacramental Confession is highly recommended. Of course, the opportunity for Sacramental Confession will be available in each of our four parishes in Opelousas at the regularly scheduled times. Also, all parishes in the Diocese will have "the light on for you" from 6:30 until 8pm on Wednesday's during Advent. Finally, there will be a special city wide Penance Service at Our Lady Queen of Angels Church on Monday, December 16, 2013 at 6pm. Besides the pastors of each of the parishes in Opelousas, there will also be other confessors available at the city wide service. The experience of God's Mercy in Sacramental Confession is something we should regularly desire and seek, especially during this season of Advent. There are still a few of the Advent daily reflections left in the church for those who would like them. The booklets were made possible by the generosity of one of our parishioners. Please thank the benefactor for this generosity by offering a prayer for their benefit during this Advent Season! 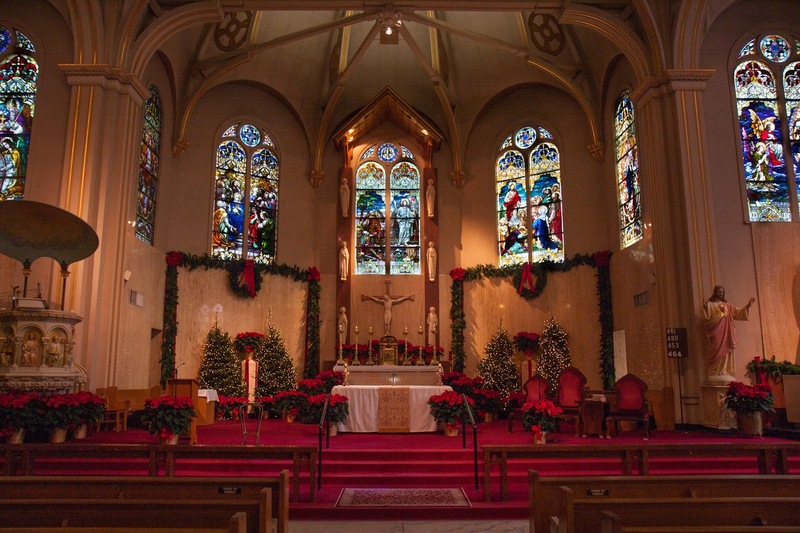 Church: St. Thomas More (Eunice) Date: Dec.9th (Monday) Time: 6:00pm Tri-Parish Penance Service. On Wednesdays of Advent---December 11th, and 18th—from 6:30-8:00pm, we will be offering confessions here at St. Landry, together with all the Catholic parishes in the Diocese of Lafayette. This outreach is called “The Light is On For You,” and is an effort on the part of our Diocese to highlight the importance of the Sacrament of Confession in the life of Catholics and to make it as easy as possible for every Catholic to come or to return to this great source of God’s mercy and healing love. You are welcome to come here or to go to any other Catholic parish in the Diocese. Please make plans to come yourself and please invite others to take advantage of this great opportunity to be reconciled and begin anew your journey in faith this Advent. The bulletin for the week of December 08, 2013 has been posted. Click here to see it. The current week's homily is available on a link on the front page of the website next to the link for the current week's bulletin. On the page with the prior bulletins, the corresponding homily will be sitting side by side with its bulletin. We started on the anniversary of the start of the Catholic Church, Pentecost Sunday --- four years ago. This week, the First Sunday of Advent, is our two hundred ninety third!! podcast to be posted. The homily is given by Father James Brady.